The Bolshevik Revolution is now definitively part of the general revolution of the Russian people. The maximalists up until two months ago were the active agents needed to ensure that events should not stagnate, that the drive to the future should not come to a halt and allow a final settlement – a bourgeois settlement - to be reached. Now these maximalists have seized power and established their dictatorship, and are creating the socialist framework within which the revolution will have to settle down if it is to continue to develop harmoniously, without head-on confrontations, on the basis of the immense gains which have already been made. The Bolshevik Revolution consists more of ideologies than of events. (And hence, at bottom, we do not really need to know more than we do.) This is the revolution against Karl Marx's Capital. In Russia, Marx's Capital was more the book of the bourgeoisie than of the proletariat. 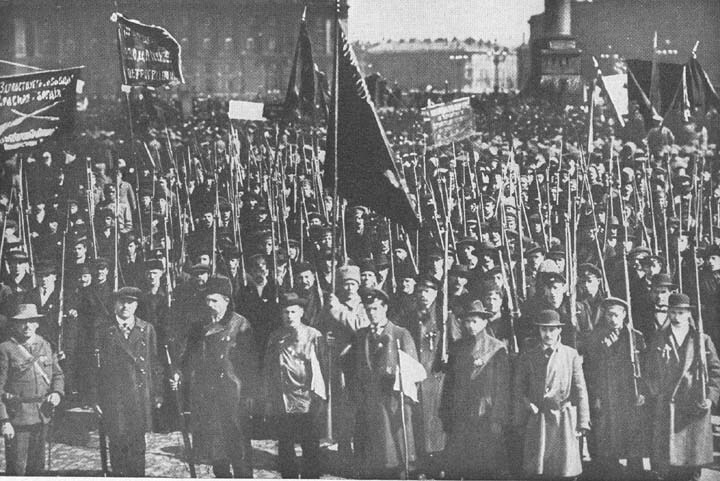 It stood as the critical demonstration of how events should follow a predetermined course: how in Russia a bourgeoisie had to develop, and a capitalist era had to open, with the setting-up of a Western-type civilization, before the proletariat could even think in terms of its own revolt, its own class demands, its own revolution. But events have overcome ideologies. Events have exploded the critical schema determining how the history of Russia would unfold according to the canons of historical materialism. The Bolsheviks reject Karl Marx, and their explicit actions and conquests bear witness that the canons of historical materialism are not so rigid as might have been and has been thought. And yet there is a fatality even in these events, and if the Bolsheviks reject some of the statements in Capital, they do not reject its invigorating, immanent thought. These people are not "Marxists", that is all; they have not used the works of the Master to compile a rigid doctrine of dogmatic utterances never to be questioned. They live Marxist thought - that thought which is eternal, which represents the continuation of German and Italian idealism, and which in the case of Marx was contaminated by positivist and naturalist encrustations. This thought sees as the dominant factor in history, not raw economic facts, but man, men in societies, men in relation to one another, reaching agreements with one another, developing through these contacts (civilization) a collective, social will; men coming to understand economic facts, judging them and adapting them to their will until this becomes the driving force of the economy and moulds objective reality, which lives and moves and comes to resemble a current of volcanic lava that can be channelled wherever and in whatever way men's will determines. Marx foresaw the foreseeable. But he could not foresee the European war, or rather he could not foresee that the war would last as long as it has or have the effects it has had. He could not foresee that in the space of three years of unspeakable suffering and miseries, this war would have aroused in Russia the collective popular will that it has aroused. In normal times a lengthy process of gradual diffusion through society is needed for such a collective will to form; a wide range of class experience is needed. Men are lazy, they need to be organized, first externally into corporations and leagues, then internally, within their thought and their will [...] need a ceaseless continuity and multiplicity of external stimuli. This is why, under normal conditions, the canons of Marxist historical criticism grasp reality, capture and clarify it. Under normal conditions the two classes of the capitalist world create history through an ever more intensified class struggle. The proletariat is sharply aware of its poverty and its ever-present discomfort and puts pressure on the bourgeoisie to improve its living standards. It enters into struggle, and forces the bourgeoisie to improve the techniques of production and make it more adapted to meeting the urgent needs of the proletariat. The result is a headlong drive for improvement, an acceleration of the rhythm of production, and a continually increasing output of goods useful to society. And in this drive many fall by the wayside, so making the needs of those who are left more urgent; the masses are forever in a state of turmoil, and out of this chaos they develop some order in their thoughts, and become ever more conscious of their own potential, of their own capacity to shoulder social responsibility and become the arbiters of their own destiny. This is what happens under normal conditions. When events are repeated with a certain regularity. When history develops through stages which, though ever more complex and richer in significance and value, are nevertheless similar. But in Russia the war galvanized the people's will. As a result of the sufferings accumulated over three years, their will became as one almost overnight. Famine was imminent, and hunger, death from hunger could claim anyone, could crush tens of millions of men at one stroke. Mechanically at first, then actively and consciously after the first revolution, the people's will became as one. Socialist propaganda put the Russian people in contact with the experience of other proletariats. Socialist propaganda could bring the history of the proletariat dramatically to life in a moment: its struggles against capitalism, the lengthy series of efforts required to emancipate it completely from the chains of servility that made it so abject and to allow it to forge a new consciousness and become a testimony today to a world yet to come. It was socialist propaganda that forged the will of the Russian people. Why should they wait for the history of England to be repeated in Russia, for the bourgeoisie to arise, for the class struggle to begin, so that class consciousness may be formed and the final catastrophe of the capitalist world eventually hit them? The Russian people - or at least a minority of the Russian people - has already passed through these experiences in thought. It has gone beyond them. It will make use of them now to assert itself just as it will make use of Western capitalist experience to bring itself rapidly to the same level of production as the Western world. In capitalist terms, North America is more advanced than England, because the Anglo-Saxons in North America took off at once from the level England had reached only after long evolution. Now the Russian proletariat, socialistically educated, will begin its history at the highest level England has reached today. Since it has to start from scratch, it will start from what has been perfected elsewhere, and hence will be driven to achieve that level of economic maturity which Marx considered to be a necessary condition for collectivism. The revolutionaries themselves will create the conditions needed for the total achievement of their goal. And they will create them faster than capitalism could have done. The criticisms that socialists have made of the bourgeois system, to emphasize its imperfections and its squandering of wealth, can now be applied by the revolutionaries to do better, to avoid the squandering and not fall prey to the imperfections. It will at first be a collectivism of poverty and suffering. But a bourgeois regime would have inherited the same conditions of poverty and suffering. Capitalism could do no more immediately than collectivism in Russia. In fact today it would do a lot less, since it would be faced immediately by a discontented and turbulent proletariat, a proletariat no longer able to support on behalf of others the suffering and privation that economic dislocation would bring in its wake. So even in absolute, human terms, socialism now can be justified in Russia. The hardships that await them after the peace will be bearable only if the proletarians feel they have things under their own control and know that by their efforts they can reduce these hardships in the shortest possible time. One has the impression that the maximalists at this moment are the spontaneous expression of a biological necessity - that they had to take power if the Russian people were not to fall prey to a horrible calamity; if the Russian people, throwing themselves into the colossal labours needed for their own regeneration, were to feel less sharply the fangs of the starving wolf; if Russia were not to become a vast shambles of savage beasts tearing each other to pieces.